Introdution: Aneurysm neck morphology, in particular the presence of thrombus, may limit EVAR. Objetives: Study whether the presence of neck thrombus and type of endoprothesis used (supra or infra-renal fixation) has impact on renal function of patients treated by EVAR at our institution. Material/Methods: Retrospective analysis of the database of AAA treated by EVAR at our institution between December/2001 and December/2013. For each patient we evaluated creatinine/clearance in pre and postoperative periods. Of patients with renal function worsening, we selected those who had acute kidney injury (AKI) according to modified RIFLE criteria, and studied the relationship between AKI and neck thrombus and type of endoprosthesis used. From the database of 241 patients, renal failure patients at the procedure and those in which we didn’t have preoperative and postoperative renal function analyzes were excluded. Regarding the study of the relationship between endoprosthesis used and renal function: 127 were treated with supra-renal fixation endoprostheses, 74 with infra-renal fixation endoprostheses and 27 were excluded (thoracic endoprostheses or missed information). Regarding neck thrombus, we obtained this data for 190 patients. Results: Regarding the presence of neck thrombus and renal function in postoperative period: of the 190 patients, 21 (11%) developed AKI and neck thrombus in > 25% and> 50% of neck circumference presented statistically significant relationship with the development of AKI (p = 0.045 and p = 0.010, respectively). Regarding the study of endoprostheses used, 14.2% of the patients treated with supra-renal fixation endoprostheses and 5.4% of those treated with infra-renal fixation developed AKI in postoperative period. However, this difference wasn’t statistically significant (p = 0.052). Discussion/Conclusions: Of our experience, neck thrombus is related to the development of AKI in postoperative period. Patients treated with supra-renal fixation endoprostheses developed more AKI in the postoperative period, but this difference was not statistically significant. European Society of Vascular Surgery. 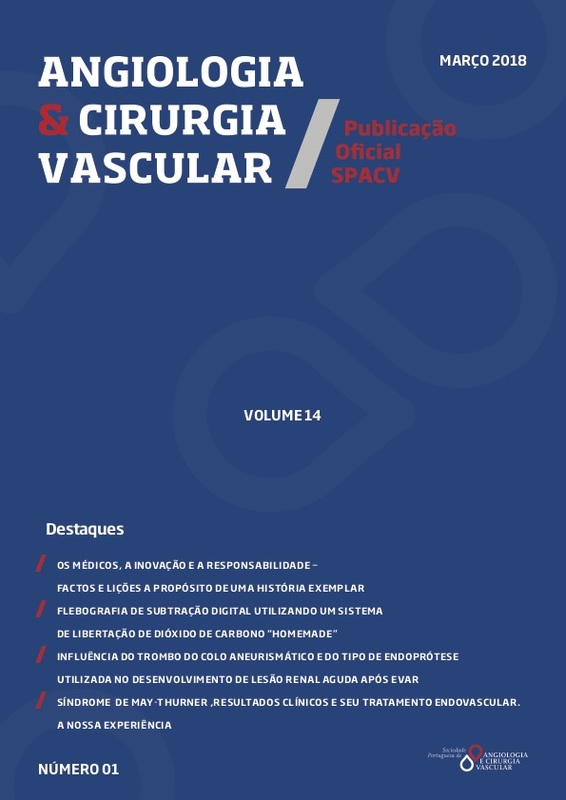 Braz J Cardiovasc Surg. for Open Repair. The New England Journal of Medicine. 5. Lau LL, Hakaim AG, Oldenburg WA, Neuhauser B, McKinney JM, et al. intermediate follow-up. J Vasc Surg. 2003 Jun;37(6):1162-1168.
associated with thoracoabdominal or abdominal aortic surgery. technical considerations and clinical summary. EVI Investigators. early clinical experience. J Vasc Surg. 2001:33(2):340-4.